Illustration from MOMA / PS1 New York . / Emergency Room Athens , Hanoi . Napoli // Room designer : Jean de Piepape . EMERGENCY ROOM is developed by the artist Thierry Geoffroy/ COLONEL. It is an art format activated in a specially designed space for exhibitions changing every day, where professional artists are stimulated to express and rank the most alarming emergencies of today. “Normally, an artist has to wait months or years to create an exhibition because it is necessary to negotiate with an art institution, find funding etc. This limits the artist with an urge to respond to the contemporary. Emergency Room is an open space that gives the artists an opportunity to do just that. Through Emergency Room, artists can scan the news media or report from their neighborhood and react to the current debate every day. Some artists are in advance of the accident . ARTISTS - being “in advance of the broken arm"? In EMERGENCY ROOM artists are "thermometers " for detecting, measuring and giving diagnosis of the dysfunctions in the society. Artists are experts in capturing alarming issues immediately or even in advance - "in advance of the broken arm". They have the ability to spot and unveil what may be an issue tomorrow and have important implications for our future. With their art works they are not only able to treat emergencies but also to prevent accidents. In order important artistic visions to reach a large attentive audience as fast as possible, what artist feel NOW has to be exhibited in real time - before it is too late. Illustration from MOMA / PS1 2007 Emergency Room New York . / Emergency Room Hanoi and Paris // Room designer : Jean de Piepape . Through EMERGENCY ROOM, artists can (if they wish) react every day and train collectively their "Awareness Muscle" (as a group, as an art movement or with the public). 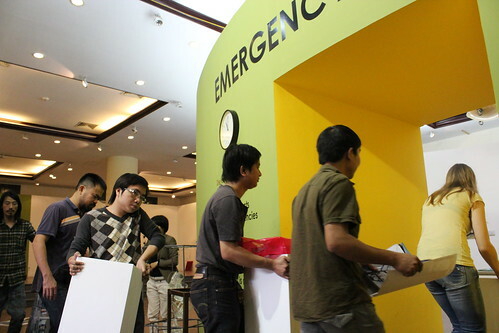 By being an exhibition alive, and commenting on burning events, EMERGENCY ROOM creates proximity to the public and to the distribution media channels coming. Everyday there is new angles, alarming discoveries and everyday there will be new interest for audience to tune back to EMERGENCY ROOM. Some artist express day after day more and more deep about a case they tackle . 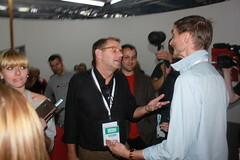 Many of the visitors come several times during the exhibition perio to follow up the daily change. The every day turn over in the EMERGENCY ROOM is kept under documentation and also can be visible . 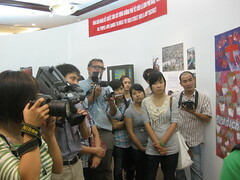 Beside the physical exhibition what is exhibited and debated in EMERGENCY ROOM is also distributed on Internet. In the media the documentation and the debate is both appearing in external medias but also in EMERGENCY ROOMs own blogs created every day. “Artists, audience and media have been fighting for weeks in order to get to see and participate in the new and innovating exhibition that with its "art of the news" puts the art institution itself to debate. Reuters, The New Yorker and the TV-channel ABC News are some of the leading media that have brought the story about the original exhibition, and at P.S.1 more than a thousand visitors per day have been seeing it…"
By stimulating the immediate artistic expression before the moment has passed and it’s too late, EMERGENCY ROOM becomes an energy generator for artists’ engagement . 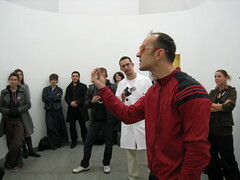 EMERGENCY ROOM is an art format that connects artists in new constellations across different cultures and art disciplines. EMERGENCY ROOM deliberately mix different kind of artist; for instance cross-media artists are sharing space with abstract painters, sculptors , photographer , with different origins and ages (biodiversity). The format encourages artists to collaborate as artist are meeting every day for the passage and the debate : a Vietnamese artist will start working with a Danish, a Polish with a Greek, a known artist with a younger, an artist will collaborate with a researchers, philosophes, journalists , detectives , art historians - all meeting each other under the clock just before deadline and working together in a shared now . EMERGENCY ROOM is a rendez-vous. 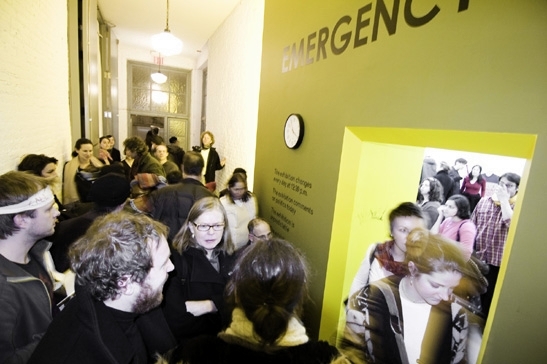 As a caravan-like platform for moving exhibitions and by activating the audience and artists from all over the world, EMERGENCY ROOM is a growing community that creates new connections between the artists. EMERGENCY ROOM is thus not only a venue for displaying of artworks, but also as a fast growing movement. Everywhere the format is actualized the community of EMERGENCY ROOM Artists grows. From earlier realizations of EMERGENCY ROOM we already have a well-developed collaborative networks and followers from France, Greece, Italy, Germany, Vietnam ; USA , Brasil ; South Africa , and other countries. New artists will thus be involved in the international artistic environment around EMERGENCY ROOM and thereby get new international connections. The institution hosting EMERGENCY ROOM is including its own community of artists. An on-going collaboration between the participating artists goes beyond the EMERGENCY ROOM as an event, often affecting the artists’ praxis. AESTHETICS OF EMERGENCY can be experienced in the Delay Museum and its collection of artworks, that were once exhibited in the EMERGENCY ROOM. This collection includes works collected in different EMERGENCY ROOMs like New York, Athens, Paris, Berlin, Hanoi, Napoli, Copenhagen and Wroclaw. 450 artists are represented in the collection and their works where shown in real time, expressing for example about homophobia in Russia already in 2011 in Hanoi, financial crises in Greece while Athens was burning in 2007 and Iraq war in 2007 in MoMA / PS1. 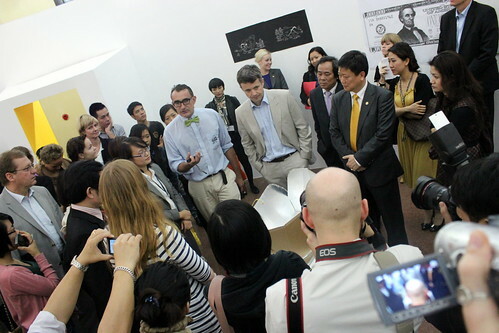 The artworks from the Delay Museum collection can be organized by the institution curators in different ways and be read through different topics like global war, xenophobia, financial crisis, global warming, Iran- USA relationship, North and South Korea and surveillance society. 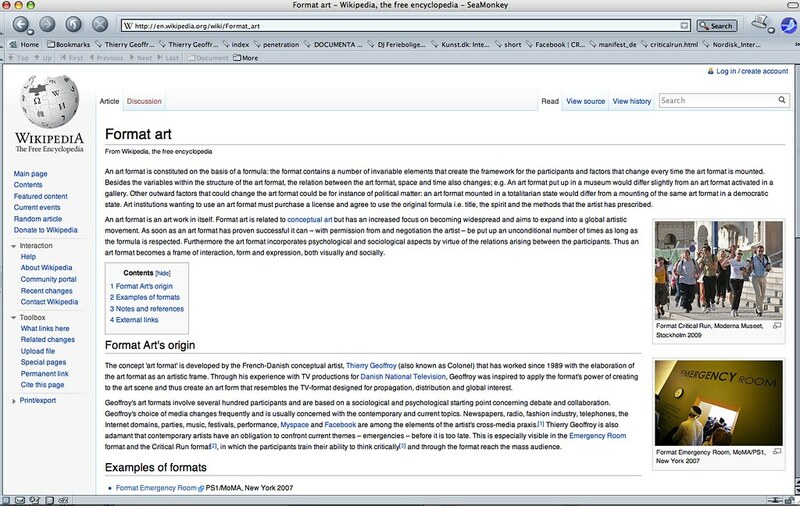 The works can also be classified by aesthetic methods (for example only work done in collaborations or work only done by abstract painters, expressing in outrage and precise way), geographically and time-based (around specific events, like Arab Spring, financial crises etc.) In this way a curator can make an exhibition with works borrowed from Delay Museum showing what happened at the time of artwork production and evaluating the pertinence of the artistic expression. Physically the Delay Museum can be constructed as a specially built room (like at European Culture Congress in Wroclaw) or integrated in the all ready existing architecture of the institution like at MOMA /PS1. Even an insertion of Delay Museum artworks in the permanent collection of the museum is possible going in dialogue . A part from EMERGENCY ROOM Thierry Geoffroy/ COLONEL has over the years developed new art formats all aiming at developping the Awareness Muscle : Critical Run, Protest Fashion, HQ Biennalist , slow dance debate ..... Those other format as complementary to ER . 1)The main building of EMERGENCY ROOM where artists exhibit their work every day at 12.30 sharp. A round room specially designed to encourage the debate around the art works. Connected to the main room there would ideally be a backstage room where artists can warm up and prepare. 2)The Delay Museum, an exhibition space where the audience can experience what has been exposed in the EMERGENCY ROOM the previous days and months. This museum is no longer ultracontemporary like in EMERGENCY ROOM but will be “ en RETARD” in French RETARD means DELAY. This “delay” of opinions, where past reactive interpretations are preserved, is a critical way of thinking about contemporary art. The Delay Museum is also a place for studying the aesthetics of the emergency. An Internet blog and a web TV channel, both connected to the social media and daily circulating the expressions of the artists. To have an own media platform is a way of creating a dynamic catalog and discussion platform, globally accessible. - Sketches and construction of the specially designed EMERGENCY ROOM, Delay Museum and back stage room. - Establishment of Internet medias and possible collaboration with allready established media . - Interviewing the artists between 12.15 and 12.30, while the artists are on their way to show the artworks at EMERGENCY ROOM, short video-interviews are conducted capturing their burning thoughts in the pulsing moment . - Installation of artworks. Every day at 12.30 sharp in the EMERGENCY ROOM the artists exhibit artworks about the very last developments of alarming issues exposing a diagnosis on current topics. The exhibition from today replaces the exhibition from yesterday the change of exhibition is called “The Passage” as it is punctual and a daily rendezvous with the artist and the audience . This is also a moment when collaborative work happens. The artists decide together about the distribution of the artworks in the shared space taking in consideration the pertinence and the level of emergency in each artwork. - The debate . 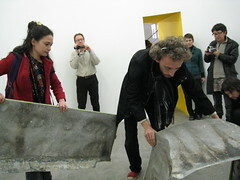 Every day, once installed, the artworks get debated ( around 12.50 pm ) and the debate is documented . 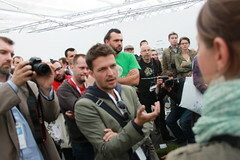 The public and the medias can daily witness the passage and also take part of the debate . 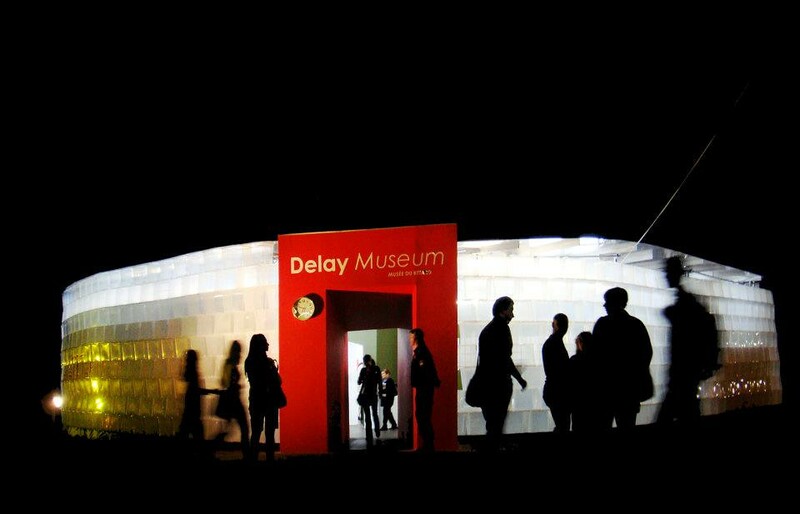 -In the afternoon ,once the debate is over the curatorial team update the Delay Museum. 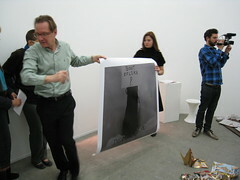 exhibition , selecting which art work from yesterday will join in . Paris,Galerie Taïss (2008 ), in Hanoi at the university of fine art (oct-nov 2009) and again in 2011 ; in Wroclaw Polish European Presidency 2011. - An education center to train the Awareness Muscle and to teach the Ultracontemporary should be established.